Calm Tummy Banana Smoothie. Soothes 3 Ways. Soothes Three Ways: Chamomile tea, ripe banana and cashew juice. New Technique: Tea Ice Cubes. Tea Ice Cubes. The first ingredient I knew I had to fit into my Calm Tummy Banana Smoothie was Chamomile tea. I planned ahead and made 2 cups of strongly brewed chamomile tea, sweetened it with agave syrup and froze it into ice cubes. Yes, I used my coconut water ice cube technique for tea! Cashew Juice. Again. 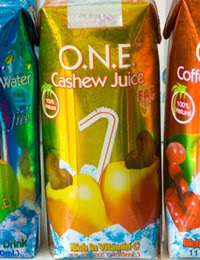 Next, I added in some of the delicious Cashew Juice that I just discovered from O.N.E. brand. It is such a flavorful smoothie liquid and some studies have shown that cashew juice is excellent for calming a stomach. And with more Vitamin C than an orange, and a much lower level of acidity, it is a great calm tummy Vitamin C substitute. Smoothie Blend. The end result is a delicious and easy to digest smoothie that is fabulous when your tummy is not feeling so calm- and even when you want to keep it feeling calm! 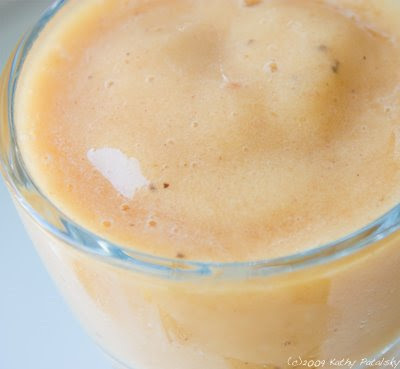 Blend all ingredients, leave out 1/2 of the raw banana and a few tea ice cubes. Add last half of raw banana and ice once smoothie is fully blended. Drink ASAP. Enjoy. Have a happy tummy. *Customize it! Want a thinner smoothie? Add more juice or soy milk. Thicker? Add more frozen fruit. Frostier? Add more ice. Creamier? Add more soy milk and less juice. Sweeter? Add a bit of agave syrup. 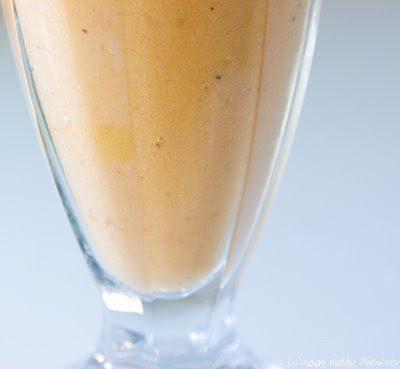 * My favorite frozen fruit for this smoothies is a papaya banana blend. Although, frozen papaya is hard to find. You may have to freeze it yourself. Also, papaya has an enzyme called papain which assists in digestion-for a happier tummy. *I love this smoothie extra banana-y. So I really do add an entire huge banana-with black spots so it is ripe and sweet-and I'll even add in a bi of frozen banana too. 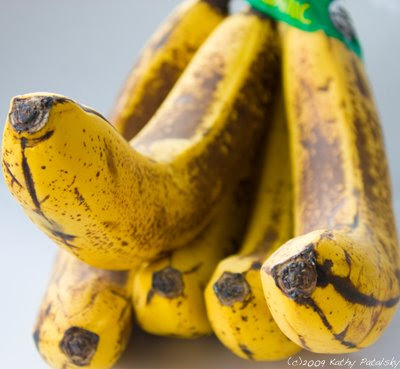 *Why the black spots on the banana? This is very important, actually. The riper the banana the more black spots will pop up. This indicates that the banana flesh has turned to mostly sugars instead of mostly starch. And sugars are much mores easily digested by the body than starches. Starches are more complex and sugars have been broken down a bit already. So make sure you use ripe bananas. *Cashew juice can be found online or in stores like Whole Foods. I like it because it is sweet, and has a mellow mandarin/peach/apple cider flavor. Plus something in the cashew juice may have an extra calming effect on a stomach. Cashew Juice is commonly seen in Brazil. O.N.E. brand sells Cashew Juice. *Other additions? You could also add in a raw mango or raw papaya. Just use more frozen ingredients or less liquid ingredients if you up the raw ingredient amount. 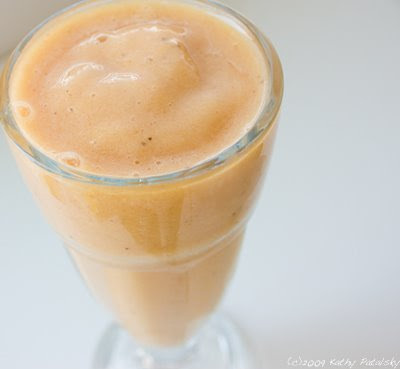 Especially papayas-they can make a smoothie watery very quickly-that's why I like my papaya's frozen. *Tea Cubes. Use a strong brewed tea, melt in a sweetened are freeze it into cubes. You could even try this technique with other teas. But for a calm tummy stick to chamomile. 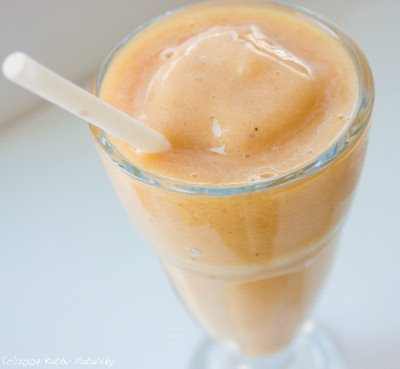 The flavor is also very mellow and blends nicely with the flavors in the smoothie.